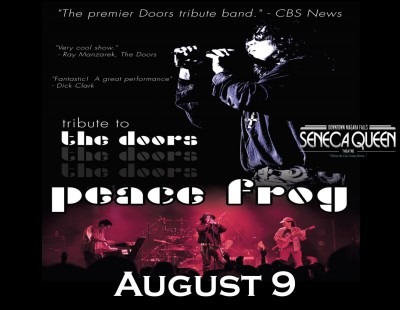 PEACE FROG is a highly acclaimed act that pays tribute to Jim Morrison and THE DOORS. Based out of Venice California, The Birthplace of THE DOORS, singer Tony Fernandez invokes the spirit of "The Lizard King" and delivers a powerful recreation of a DOORS concert experience. PEACE FROG transforms any venue into the kind of dark, mystical, hypnotic rock theater that made Jim Morrison and THE DOORS rock legends. Audiences will be captivated by intoxicating renditions of "Hello, I Love You" "Light My Fire" "L.A. Woman" and more.